I made this image in 2003, more than a year before we were married. We were so young then. When I was younger, during less happy periods in my life, sometimes people would try to encourage me with the maxim, “At least you have your health.” Having been healthy all my life, and healthy and surrounded by healthy people when I was young, this maxim tended to fall on deaf ears, or at least ears living in a small world. I knew little of what it might be like to be in poor health. This is probably common among the young. You can join a pick-up basketball game any time you want, and you can go on as many ski trips as you can afford. In fact, there were significant periods of my young 20s during which I had no health insurance of any kind. 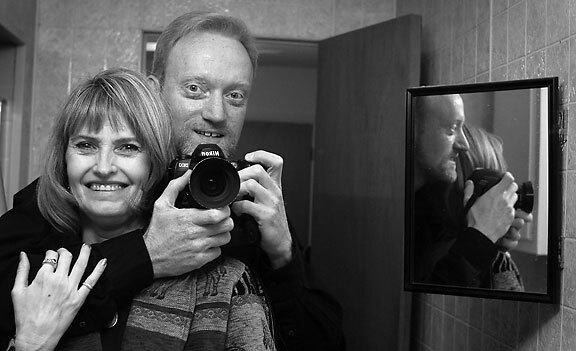 I write this as my wife Abby sits in a hospital bed, recovering from another in a long line of serious illnesses. She has a number of conditions that fall into the constellation of autoimmune disease, and as much as we both try to keep her healthy, sometimes she gets alarmingly sick. The night before, at home alone, I awoke to the sound of her voice calling my name, as though she were calling to me in my dream. I miss her quite profoundly when she is gone. This isn’t a complaint about money. Abby and I have always had good insurance, and we have never hesitated to seek medical help because of financial concerns. When Abby is sick, we bring the best medical care at hand to her bedside. 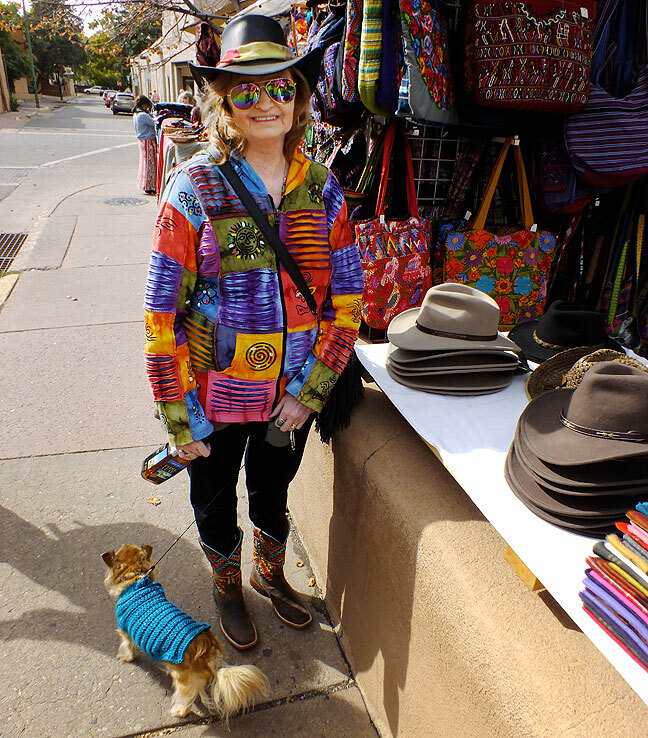 Abby smiles as she and I walk our dogs on The Plaza in Santa Fe, New Mexico, last October, on a perfect autumn Saturday. Sorry to hear Abby is in the hospital. You are right – life is unpredictable and we play the cards we are dealt. Meanwhile, glad to see that you are not taking life for granted. Each moment is a precious gift. I realized how fleeting life is, how quickly it can be taken from anyone at any time, and how we should enjoy what we have of it — however much or little — when my mother was diagnosed with lung cancer three years ago. I saw the profound impact it made on her in terms of things she wished she had done, or things she wished she had done differently. I know she had a lot of regrets at the end, and I know people who were close to her who had many of the same regrets. (For example, she did not marry the man she loved, and it weighed heavily on both of them.) So your blog entry really hits home, rings true, and makes me think even more about what I have in terms of family and health, and what it means. Thanks for this. I, too, have learned to accept my biology. I hope Abby is feeling better soon.